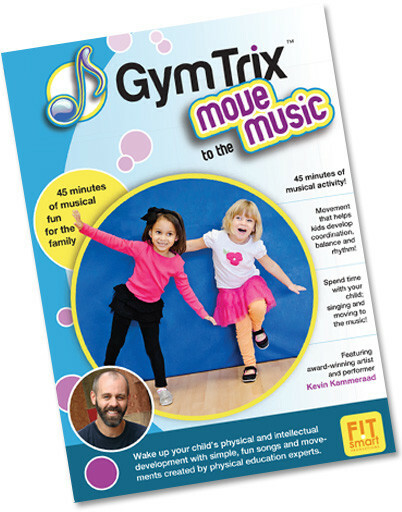 When you spend a little time with GymTrix™ Move to the Music your family will be singing the catchy tunes all day. More importantly, when kids get in the groove of the rhythm they learn balance, coordination and motor skills. This develops the skills for a lifetime of physical activity- from playing team sports to just plain having fun. The main focus: Movement and music that helps kids develop balance, coordination and rhythm! "I LOVE it! The kids in my daycare LOVE it! We have included it into our everyday schedule! It is great for me too, to do along with the kids. You would think chasing lil' ones all day I would be in great shape, but I find myself out of breathe when I do it, so it's a great addition to my day as well." Here’s a great way to warm-up and feel the rhythm. Clap your hands, tap your feet. This song helps kids in music class at school, gym class and on the playground. Get a little silly with your face. Get a little crazy with your body. This is the smart way to learn how to move every single part of your body. In this fun piece kids get into a position and then freeze. It helps them learn how to control their arms and legs so they can be stronger and more coordinated- FREEZE! Learn how to march, gallop and skip. This helps kids with balance and spatial awareness… which is important in all sports. We know it’s not polite to point, but in this song kids learn to listen carefully, follow along and see how quickly they can use their right and left hands to point to the correct body part.